Garlic is an important supplement that has many different benefits for the body and your health. It can improve cardiovascular health and even reduce the risk of cancer as well as other benefits. We looked at the most popular garlic supplements on the market and compared them for ease of use, dosage amount, purity of ingredients, reputation of the manufacturer, and customer reviews from consumers who are taking the supplements. From those comparisons we took the three best garlic supplements and reviewed them below. Any one of them would be a good method of adding this important supplement to your daily routine. Most people are familiar with garlic as an herb for dishes but over the last several years it has gained recognition as a preventative supplement. There are many different kinds of garlic supplements on the market. Garlic supplements can come from a variety of different places so it is important that you have the knowledge to sort through the ones that are of lower quality so you can choose the perfect garlic supplement for your needs. Garlic has been valued for its revitalizing benefits for a long time. Nature’s Bounty Odorless Garlic supports a healthy heart as well as keeping your cardiovascular system and cholesterol levels normal. If you have high cholesterol, garlic won’t correct it, but in combination with a healthy diet and exercise program, it can keep things stabilized and running smoothly. The soft gels are easy to swallow and provide 1000 mg of valuable garlic without the worry of smelling like garlic from taking it. These soft gels have been processed in a specialized way, using a cold processing method that preserves the garlic’s natural beneficial goodness while reducing the odor. You’ll find no artificial colors, flavors or sweeteners in this product. It also has no wheat, gluten, soy, milk, yeast, sugar, fish or lactose. Your daily dosage is 1 soft gel 4 times a day to get the needed healthy amounts which will give you the beneficial health effects you want. Fresh garlic extract has been proven to be important to heart health and cardiovascular health in over 15 different studies. Enzymatic Therapy Garlinase contains the amount of garlic that is recommended to reap these benefits. All you need is one tablet every day. You won’t ever have to worry about your breath smelling like garlic. It is 22 times more concentrated than regular garlic. 1 tablet is equal to 4 cloves a garlic and it is much easier to take. It is the #1 selling fresh garlic supplement available. The enteric coated tablets go to the small intestine and dissolve so you get what you need without having to be embarrassed about garlic breath or garlic body odor. The Patented Swiss Process makes sure that this product offers the maximum absorption and freshness possible. 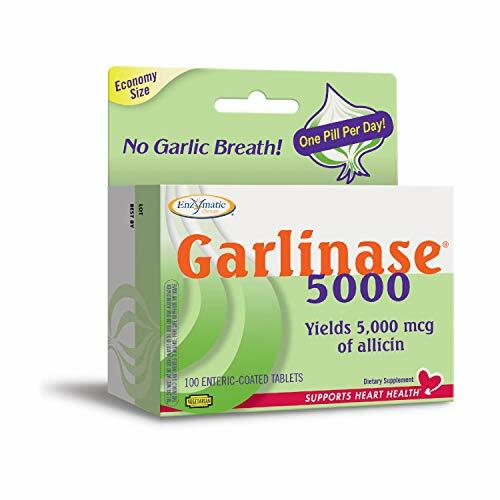 One tablet gives you 5000 mcg of Allicin, which is fresh garlic’s most valuable compound. It contains no animal products at all making it just fine for vegan and vegetarian usage as well. It also has no sugar, salt, yeast, gluten, corn, soy or dairy products. When people use garlic supplements everyday it’s been shown to provide a lot of health benefits. Most of these benefits come from the 100 different sulfur compounds it has including one of the most important; Allicin. It can help maintain cholesterol levels and also provides important cardiovascular support. 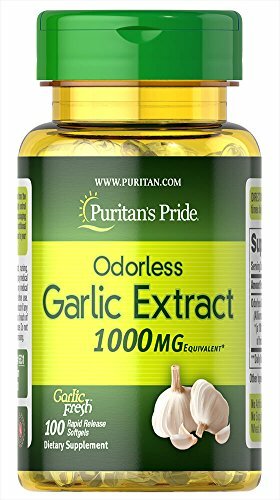 Puritan’s Pride Extra Strength Garlic Oil has been manufactured at a GMP certified plant and has been NSF verified. The new formula contains soybean oil that is the principal source of omega-3 fatty acids and Vitamin E.
All you need to reap the benefits of this supplement is to take 2 soft gels daily which will give you 2000 mcg of Allicin. It is the best value garlic supplement for heart health and cardiovascular health on the market. It has met the CA Proposition 65 requirements for Purity and contains no artificial flavors or ingredients. Choosing the right garlic supplement is an important step in making sure that you are getting a good quality variety of garlic. There are good quality supplements and low quality supplements. Paying attention to where they come from and the reputation of the company can help steer you in the right direction. The three top rated garlic supplements reviewed above are all good examples of quality garlic supplements that come from well know vitamin companies known for their quality and freshness. Continue learning more about garlic supplements by following our buyer’s guide. The purpose of this guide is to make sure you understand what you need to look for when you are searching for good quality garlic. With the right knowledge you will be able to sort through the large selection of garlic supplements available and choose the one that is the right fit for your needs. There are a few things that you want to check when it comes to researching different garlic supplements. These points will ensure that you are purchasing excellent quality garlic supplements that contain standardized Allicin. This will guarantee that the supplement you take will be absorbed into the bloodstream properly and provide the most benefits. If you tend to get digestive upset and are sensitive to garlic you can still take garlic supplements. Just make sure that you choose enteric layered pills. Enteric layered garlic pills have a layer that is acid resistant. This will shield it from any acidic attributes and just allow it to be absorbed by the small intestine rather than getting into the stomach where upset can occur. Make sure the garlic supplements you are considering are standard for Allicin content. This means a constant amount of allicin is in each batch. Pass by the supplements that have been heat-treated. The energetic sulfur parts of the supplement are very sensitive to heat which can make them less that optimum. Make sure that the garlic supplement is bio readily available. The importance of this is so that the supplement can be easily and successfully soaked up into the blood stream. Consider sticking to garlic supplements that are from reputable vitamin and supplement companies. The more well known the company is the more you can find out about their practices and reputation. Purchasing supplements from a well known and trusted company can give you peace of mind that the supplement you have chosen is a good quality one. There are many benefits to taking garlic supplements. We have listed the more well known advantages that have been linked to taking garlic supplements. Reducing the Risk of Cancer – After specific studies were done on garlic supplements, it was found out that taking this supplement can offer protection to users against colorectal cancer and gastric cancer as well. It can also reduce the negative side effects of chemotherapy. When this supplement is taken by cancer patients it enhances their appetite (loss of appetite is a common side effect of chemotherapy treatments) and remove fatigue as well. It can also offer protection for cancer patients against intestinal damage that has been linked to chemotherapy as well. Antibacterial Benefits– Those who take garlic supplements have greater success warding off bacterial infections including strep. They can also stop parasites from interring the body. Please note that taking garlic supplements has a blood thinning effect so if you are having any medical procedures done you should stop taking the supplements until the procedures are over and the doctor okays returning to the garlic supplements. Can Reduce Blood Pressure – High blood pressure is known as the silent killer because sometimes people don’t even realize they have it. Taking garlic supplements can have a significant effect on the blood pressure due to the active ingredients that are present in garlic that can help bring those numbers down. Improves the Immune System – Having a strong immune system is very important any time of year, but when it is cold and flu season, a strong immune system can help reduce the chances of you getting these bothersome illnesses. There are many studies that have been done that describe the antifungal and antiviral properties that garlic supplements have. These properties mean fewer colds and flu. Fights Heart Disease – Taking garlic supplements help protect the heart by reducing blood pressure and LDL cholesterol as well. It also enhances blood flow and prevents the aggregation of platelets when the supplements are taken regularly with your meals. Can Reduce Dementia and Alzheimers – Because of the antioxidants that garlic has in it; your body can be protected from oxidative damage that free radicals can cause. This damage speeds up the aging process. Large doses of garlic supplements have shown an increase in the antioxidant enzymes that humans have as well as significantly reducing the oxidative stress that people with high blood pressure problems have. It can even reduce the risk of dementia and Alzheimers. There are several different types of garlic supplementation. The most common type of supplement is capsules. Most often the dosage is one or two capsules each day. Supplements can have different concentrations so be sure to ask your doctor how much they recommend to achieve your health goals. Garlic supplements can take many forms. They can be whole garlic that is fresh, dried garlic, freeze-dried garlic, aged garlic and garlic oil too. In general you should try to take around 2 to 4 grams of garlic each day. If you prefer fresh garlic, the average sized clove of garlic is about 1 gram. If you are taking aged garlic extract it has a lot less allicin than fresh crushed garlic has. You will probably want to aim for around 600 to 1200 milligrams that is separated over the course of the day instead of all at once. Freeze-dried garlic supplements come in tablet form that is usually 200 milligrams each. Most people looking to take garlic supplements take roughly 6 tablets per day, two at a time. It is always a good idea to check with your doctor before starting any supplements especially if you are on any medications. Your doctor will be able to tell you what dosage you need. The benefits and power of garlic has been known for awhile now and it is gaining in popularity as a supplement that can bring about a lot of health benefits. If you are choosing a garlic supplement to improve your health, you want to look for supplements that have high allicin content. Even though some companies avoid placing the allicin content on the bottle you want to find the supplements that are open about this. Avoid supplements that use the word aged or odorless on the container due to the fact that garlic loses a lot of its allicin content when it is old. Garlic has been used for a long time to boost your heart health and to treat illness and other ailments that can come up. Most people don’t want to take garlic because of the smell. They worry about people being able to smell the garlic. The best time to take the garlic supplements is in the morning before you brush your teeth or you can take them before you go to bed at night. Fortunately, due to the increasing popularity of this supplement, manufacturers are creating supplements that don’t cause the strong garlic breath that they used to. The three top rated garlic supplements we featured above are all good choices but if they don’t appeal to you, use the information in this guide to sort through the large amount of garlic supplement selections available so you choose the right one for your needs.